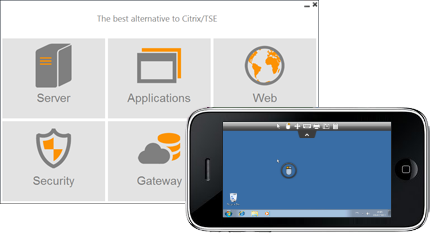 NetForChoice enables any of your Windows from XP to Windows 10 (even Home editions) and Server 2003 to 2012 R2 to act as a Citrix or a Terminal Server. NetForChoice supports concurrent Remote Desktop (RDS) connections, printer mapping, disk mapping, port com mapping, bi-directional sound, remoteFX, dual screen. Any RDP compatible client can be used to connect on a NetForChoice System. NetForChoice Administrator Tool is a unique application that centralizes all of the server's configuration tools, including Windows features, in one easy-to-use interface. NetForChoice enables you to generate a portable remote connection client that integrates all the required settings. When working remotely on your server, NetForChoice allows opening Word documents, Excel workbooks and other files automatically on the user side. There is no need to install Office on the host server. NetForChoice Gateway Portal enables access to multiple servers with web control of the user credentials and Single-Sign on (SSO). It is also possible to assign specific servers to specific users or groups, in order to control servers access. NetForChoice load balancing feature can split the load between multiple servers of your cluster. It also allows falling back to failover servers in case of a production incident. Up to 20 servers within one farm - contact us if you need more.